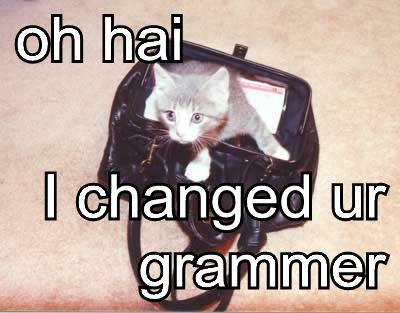 Anil Dash has written about a subject I have been pondering lately (the weather’s too nice for my tinfoil hat *sigh*): Cats Can Has Grammar. Or, in other words, the “lolcat Internet meme” (see this site for instance) involves a grammatically consistent subset of English. Technically (I am taking Anil’s word for it) it’s a pidgin. I find this fascinating, as well as funny. Be sure to read all of Anil’s post, and the comments. I can’t believe I am late for a business meeting because I wrote this post. Update: Massive over-analysis of the phenomenon here (with fancy diagrams). Isn’t this actually a change of spelling rather than grammar?